On Saturday May 19, I attended the 10th annual Multicultural Festival “DiverCity”at New Westminster’s Fraser River Discovery Centre where I was treated to a slate of Asian Canadian films organized by ExplorASIAN. One of them was Montreal-based director Monica Mak’s “Tiara.” An impressive and insightful short film about Asian Canadian beauty pageants, Tiara reveals the complexities and tensions that young females must endure in a commercially and financially lucrative industry of beauty. The experiences of five former beauty pageant contestants show just how divisive the industry can be: while winners can go on to wealth and fame – landing mega contracts and careers in Hong Kong and India, going onto to careers in law and medicine, others suffer the consequences of finishing poorly and vulnerability of being judged solely on their physical beauty (or lack of it). Tiara made me think differently about beauty pageants, it never occurred to me that ethnic pageantry had such a darker, seamier side of global commerce. This entry was posted in Uncategorized on May 28, 2012 by admin. 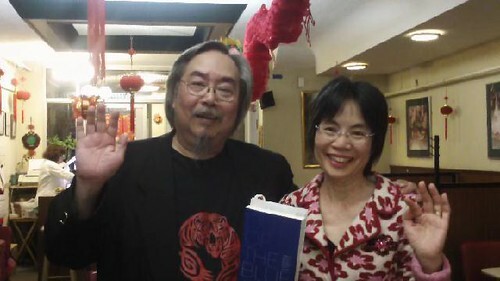 Jan Wong at Kogawa House tomorrow – wonderful turnout and talk in Vancouver Chinatown. 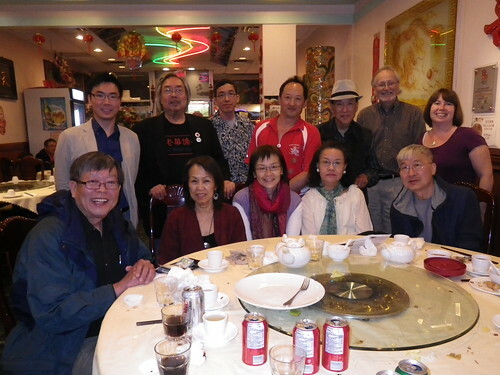 Last night she did a dinner event with Asian Canadian Writers Workshop in Vancouver Chinatown… It was great! 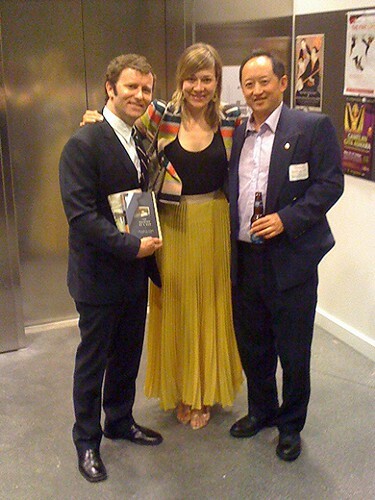 We introduced her to some of Vancouver’s Asian Canadian authors, publishers, journalists and community activists. She talked about the story she wrote for the Globe and Mail, which became an issue. She described how her editor did not support her, and the G&M did not support her sick leave. It gets worse… She was denied long term disability, after going into a depression caused by the workplace issues. And it gets further worse, after she discovered the insurance company Manulife, had hired investigators to take videos of her, to diagnose her “depression” and deny them. But there is a happy ending. On Tuesday, she was in Victoria giving a talk and reading for 200+ people for the Chinatown Lionesses in Victoria Chinatown. Jan Wong had a good connection with Joanna Chiu, who just graduated a few days ago from Columbia School of Journalism in NYC, which Jan graduated from 31 years ago. It was also Joanna’s birthday, so we followed up Jan’s talk, with a spontaneous singing of Happy Birthday to Joanna. But, I also made Joanna “work” on her birthday… while we waited for dinner to arrive, Joanna interviewed Jan for a future issue of Ricepaper Magazine. You’ve heard of Sing-a-longs to the Sound of Music by Rogers and Hammerstein? a sing-a-long to Rogers and Hammerstein’s musical about Chinese-Americans. VACT screens Rodgers & Hammerstein’s movie classic, Flower Drum Song!WATCH the original 1961 movie trailer HERE: http://www.youtube.com/watch?v=nMdUVxOI3SU.TRIVIA Contest! What was Jack Soo’s (Sammy Fong Character) real last name? Check for answers on Facebook on Friday! Help the Vancouver Asian Canadian Theatre (VACT) raise some funds at their 50/50 draw, Silent Auction, White Elephant’s Table and Trivia Contest Game! Come in Costume and enter the Costume Parade contest to win a Prize! Lots of good old family fun! Check out the costume style for those interested in the Costume Contest.But WAIT! $15 Ticket Price includes popcorn and a soft drink! Event starts at 7:30pm, movie begins at 9pm (superior film quality from blue ray projector). 2 hours of Validated parking on Denman & Nelson(hotel parking). Many other memorable scenes waiting to be re-discovered on the big screen!. 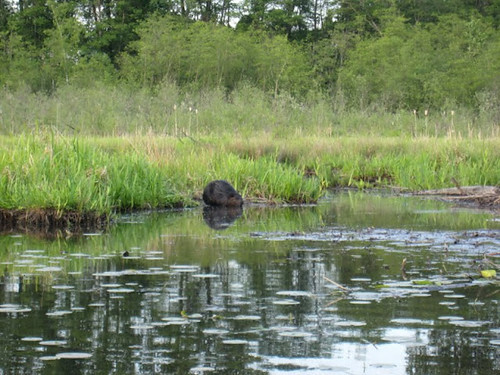 Beaverspotting… How many Canadians have actually seen a beaver in the wild… in the middle of Metro Vancouver? We wanted to see that great Canadian icon, a beaver… in the wild. 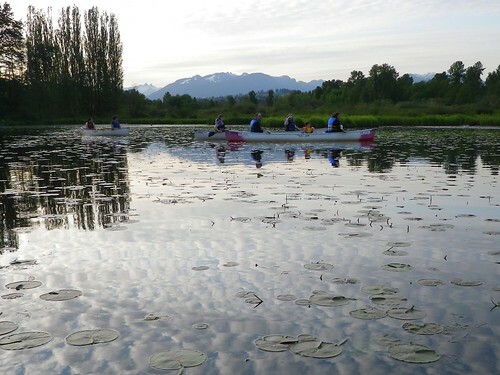 So we rented canoes from Deer Lake at 5:30pm, put them on our cars, and launched them by 6:30 pm at the Burnaby Lake Rowing Pavilion – where a wedding reception was in place. It was a beautiful warm late-spring day on May 19th, Victoria Day Weekend. Our party of 10, included 6 members of the Gung Haggis Fat Choy dragon boat team + 4 family members, one of which was a small child. This picture features Xavier and his wife Val in the left canoe. 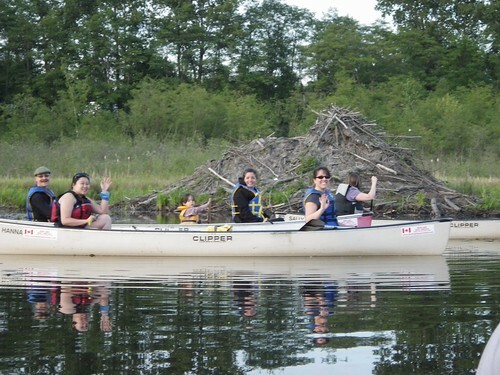 I am in the canoe on the right with KK and Sam. It was my idea to take people to Burnaby Lake and look for beavers. 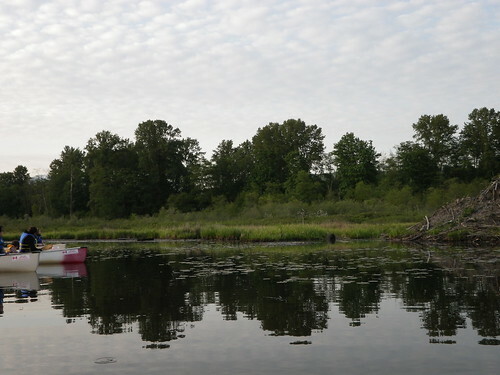 From 1993 to 1998, I had lived in a house beside Burnaby Lake, next to the Wildlife Refuge Centre on Glencarin Dr. We used to have a canoe at the house, and I would drag or carry the canoe down to the lake by myself or with friends. I would see many beavers, and one summer I counted up to 12 beaver lodges. During those five years, I also saw the lake become increasingly silt-ified – to the point I could no longer launch the canoe down from our house. I would have to put the canoe in my car and drive it to the Burnaby Lake Pavilion. 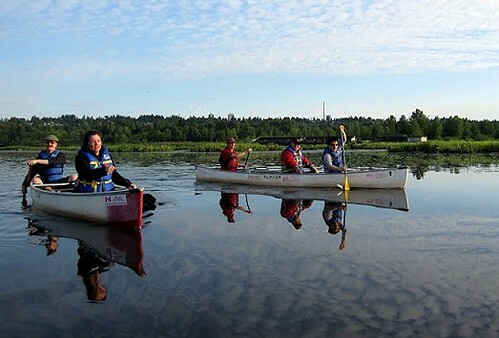 In 2003, one of my first dates with Deb was on a canoe on Burnaby Lake with my friend’s dog… which would gently tip the boat as it would lean from side to side. Where are we? The magnificent urban wilderness of Burnaby Lake is in the center of Metropolitan Vancouver, and it is part of the biggest urban watershed known as Brunette River Watershed that drains from Renfrew Heights in Vancouver; Metrotown, Capitol Hill, Deer Lake and Burnaby Mountain in Burnaby; then empties via Brunette River into the Fraser River. You can see Grouse Mountain and The Lions in the background of this picture- not far away at all. We found a beaver house, but no beaver… Everybody marveled at how big the beaver house was. Big smiles from Xavier, Debbie, Marlowe, Val, Anne, while Deb keeps paddling. Xavier had canoed many times in Algonquin Park in Ontario, but never seen a beaver in the wild before. Anne is from France, and wants to see as much of Canada as she can. Debbie has lived in Vancouver and Hong Kong, and never knew such wilderness existed before in the middle of Burnaby. Deb saw a beaver last year on Kalamalka Lake, while swimming near her parents’ lakeside home. The first time I saw a beaver in the wild was in Lake Louise. A beaver house is not to be confused with a “beaver dam” which is built across a waterway to create a flooded area for the beaver to easily swim and navigate through. See this link: how to create a beaver house. In search of the mysterious beaver, we paddled up Still Creek, and had to pass under the pedestrian bridge which is part of the 10km trail that circum-navigates Burnaby Lake. 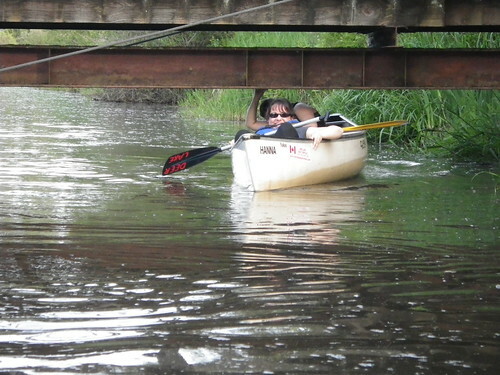 It was a tight squeeze, but we got underneath the bridge by ducking… it was fun! Still Creek is very interesting as it enters Burnaby Lake. You might think you are in the middle of nowhere, but it is right beside the rugby fields, the traintracks, and Government Road. We paddled under Sperling Road until we came to a dock that blocked the way. I have paddled past the dock up to Willingdon St., but we decided this was far enough for our evening adventure, and we really hadn’t seen any beavers yet. Paddling back downstream, I suddenly heard loud shrieking noises. “Beaver! Look! Look!” This was quickly followed by a loud “Splash!” as the beaver splashed its tail, and disappeared under the water. Beavers splash their tails as a warning, to let other beavers know there is possible danger. We quickly told the the females in our expedition to keep their voices down if they see a beaver, or they will scare it away again. The next somebody saw a beaver, we alerted each other by quietly pointing in the direction the beaver was swimming on top of the water. 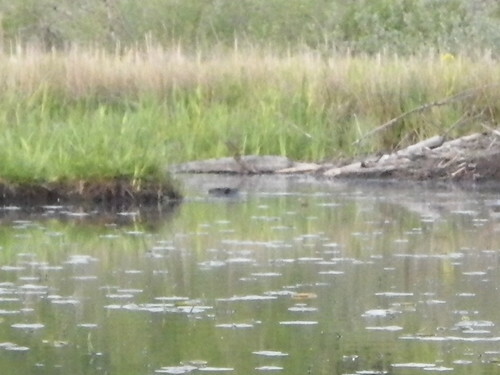 Can you see the beaver in this photo? You can see its nose, eyes and ears, as it swims with its head above the water. We quietly watched it swim in front of the beaver house, then climb onto the shore. It seemed to sit there posing for us for a good ten minutes or more. You can see how close we were to the beaver, as we sat quietly in the canoes. It is the little dark spot on the edge of the water. Mission accomplished! Anne got this great shot of the beaver! Author Susan Aihoshi will read from her new book, Torn Apart: The Internment Diary of Mary Kobayashi, the latest title in the Dear Canada series published by Scholastic Canada. Torn Apart is the fictional diary of a young girl growing up in Vancouver during the Second World War. Mary enjoys school, her family and friends, and going to Girl Guides. But Japan bombs Pearl Harbor on December 7, 1941, and life for Mary, her family, and the entire Japanese Canadian community in British Columbia changes dramatically. Susan’s reading will be followed by a short presentation of related photographs. She will also answer questions and sign books. 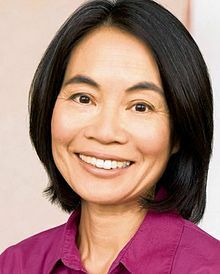 Journalist Jan Wong worked for the Globe and Mail, serving as Beijing correspondent from 1988 to 1994, when she returned to write from Canada. In 1996, she published Red China Blues: My Long March from Mao to Now, which was promptly banned in China. After a return trip in the late nineties, she produced a second book entitled Jan Wong’s China, a somewhat less personal account of social life, the economy, and politics in modern-day China. 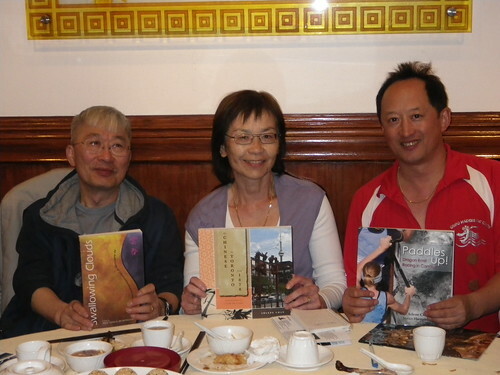 Subsequent books include Lunch with Jan Wong, Jan Wong (2001), Beijing Confidential: A Tale of Comrades Lost and Found Doubleday Canada, and her newest title Out of the Blues: A Memoir of Workplace Depression, Recovery, Redemption, and Yes Happiness. Ms. Wong will read from and discuss Out of the Blues over lunch at Historic Joy Kogawa House. Please join us! Space is limited. To reserve a seat for either event, RSVP to kogawahouse@yahoo.ca. 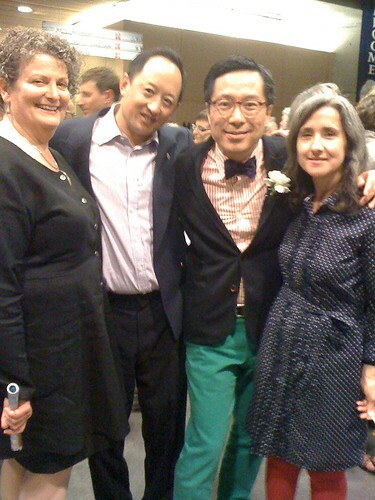 Jan Wong is coming to Vancouver…. and we’ve created a fun event you can attend! 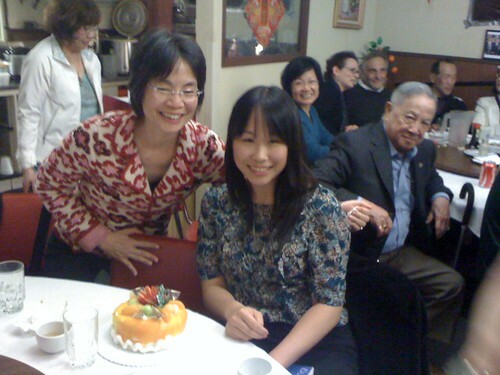 I first met Jan Wong in 1993, when she was bureau chief in Beijing for the G&M. I was the guest speaker at the Terry Fox Run, at the Canadian Embassy. 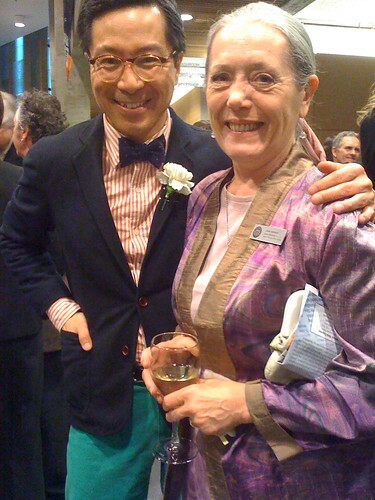 Since then I have read her books “Red China Blues”, “Jan Wong’s China”, as well as her “Lunch with Jan Wong” features in the Globe & Mail. Her books give a special insight to China, because she first was one of the first foreign students to study in communist China during the “1970”, overcame her Maoist beliefs, and saw behind the Chinese government presentations and propaganda. May 24th Thursday – 5-6pm Free Reading at UBC Main Library,free author talk, Irving K. Barber Learning Centre, Lillooet Room (Rm #301). Doors open to public 4.45pm. 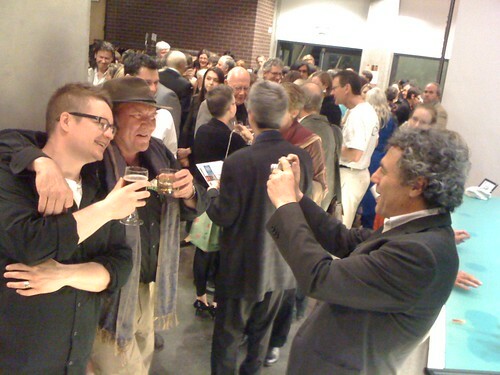 Reserve your ticket with a credit card by phone (604-872-3464) or pay online here. After the Chinese-Canadian veteran soldiers came back from serving overseas in Asia and Europe, fighting for Canada, they helped to launch the appeal of the Chinese Immigration Act, also known as the Chinese Exclusion Act. Starting in 1885, a head tax of $50 was imposed on Chinese immigrating to Canada. Only Chinese – no other nationality was taxed in this manner. In 1900, it was increased to $100, and to $500 in 1903. Then on July 1st, 1923, the Chinese Exlusion Act was passed in Canadian Parliament, effectively banning any immigration from any person of Chinese ancestry – even if they were born in the USA. After WW2, Canadians understood the atrocity of racism, having witnessed the liberation of Jewish Internment camps and mass graves in Nazi Germany. But it still took a concerted effort of Canadian born citizens of Chinese ancestry to challenge Parliament and demand equality. I am proud to say the my grand-uncle Daniel Lee was one of these Canadian veterans, along with his friend Roy Mah. CCNC pays tribute to the families and groups that lobbied over decades to repeal this racist legislation. The Chinese Exclusion Act separated families and some were never able to reunite. The community stagnated as few families were formed due to an unbalanced gender ratio, aging, and some Chinese leaving Canada. Some Canadian-borns volunteered and fought overseas for a country that didn’t even recognize their basic rights. Here is the story of the late Sgt Louis King and Operation Oblivion (written by Gary Gee): http://ccnc.ca/entryContent/08d45b830c5eb287.pdf.